Once the Text Analytics module is installed, you must configure the location of required files and the connection to Coveo Enterprise Search (CES). This configuration generally only needs to be done once. Copy the entity discovery plugin license file (license.v5) that you received from Coveo to the [Text_Analytics_Path]\Lexalytics\ folder. From the Coveo Master server, copy the a search security certificate file used by your Coveo Front-End server(s) (such as [Index_Path]\Config\Certificates\cert-iis.p12). On the server where the Text Analytics module is installed, paste the certificate file in a text analytics subfolder of your choice. Example: Create the D:\TextAnalytics\CES_Certificates\ folder, and then paste the certificate file in it. In the Text Analytics section, under Salience, in the License box, ensure that the path/filename points to the entity discovery plugin license file that you saved earlier. In the Host box, when you installed the Text Analytics module on a server other than the Coveo Master server, enter the name of the Coveo Master server, otherwise, leave localhost. When CES uses a port other than the default one (52800), in the Port box, enter the port used (see About the CES Service Port). In the Certificate box, ensure that the path points to the location of a valid search security certificate file. In the Super User Token box, paste the ID of the super user account that you created and copied earlier for the Text Analytics module. Still in the CES section, under Admin Service Credentials, enter the credentials of the administrator account to use (Domain\Username and Password). Note: This account must have CES administrator permissions as it communicates with the CES administration web service to perform tasks such as license status verification and tag field creation. If the password changes, you must recreate the configuration. In the Save Configuration File as dialog box, browse to the [Text_Analytics_Path]\Config\ folder, in the File name box enter a name of your choice (ex: FirstTimeSetup), and then click Save. The parameters that you configured in this procedure will be automatically included in new pipeline configuration files that you create using templates. 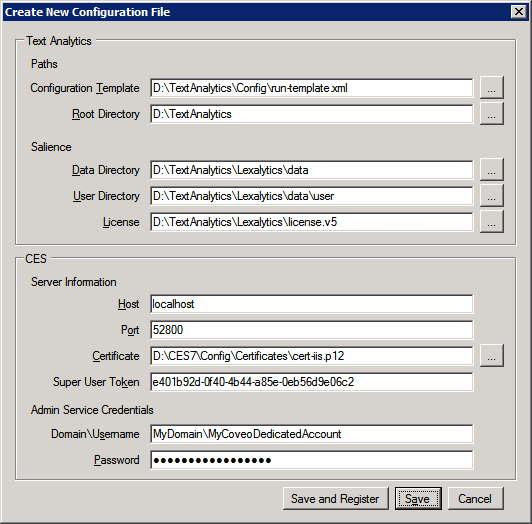 Ensure that your text analytics installation and configuration is operational (see Testing the Text Analytics Installation).